The Awakening brings an end to The Graveyard Queen series. While paranormal Southern Gothic is not my usual reading choice, the imaginative and atmospheric writing of Amanda Stevens sucked me in from the first novel in the series, The Restorer. Amelia Gray is a restorer of forgotten and often historic graveyards throughout the South, and she has been able to see ghosts since she was a small child. Her father also had that ability and warned her to never let a ghost know that she sees it. Amelia began breaking that rule in The Restorer and has been led into many life and soul threatening situations since, as well as learning more about her ability, her family history and perhaps her destiny. She has been hired to restore Woodbine Cemetery, just outside her home base of Charleston. She is happy to be working close to home but unhappy to be so near to John Devlin, scion of an aristocratic Charleston family. The two were lovers, and it was to save John Devlin that she first broke her father's rule. It has been about a year since John broke with her abruptly and returned to his family. His engagement to a Charleston beauty has made her lose hope of a reconciliation. On her first day at Woodbine, Amelia discovers that the site is the burial ground for the secrets of Charleston society. She is drawn to one monument, in particular, that of a child with the inscription, "Shush...lest she awaken...". Something wakes up for sure, the ghost of an angry little girl who follows Amelia home and shows her visions of the girl's murder. Who is the child and can she have a connection to the Devlin family? Amelia's suspicions only increase when she discovers that she got the job through the machinations of John Devlin's grandfather. 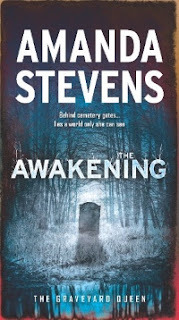 The Awakening conjures all the ominous and foreboding atmosphere of the previous books and brings to a satisfactory close the story of the Graveyard Queen and John Devlin. I have to say that following The Graveyard Queen has been an uneven experience for me. There have been many times that I thought Amelia was walking into danger even when it was clearly the wrong move. Each of the preceding books seemed to end with more questions than answers. But still, I kept reading to see where Stevens was going with the story. These are definitely not books to be read in the dead of night! I recommend it for fans of the occult and all around spooky events. Thanks to MIRA and NetGalley for an advance digital copy. The opinions above are my own.